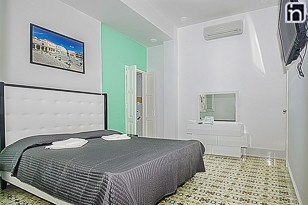 Hostel Habana Moscow is where e tropical-traditional style meets modern western European minimalism. Outside this 1956 house seems like any other house in the Old Havana neighbourhood. Nevertheless, inside there is an unexpected mix between comfort and minimalism. The house is painted in pastel colours, making its architectural pre-revolution style the main selling point. A strong contrast to the deteriorated façades of the building that surrounds the location. 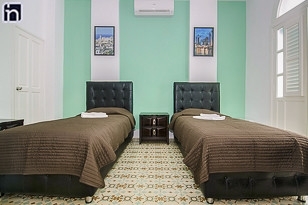 Hostel Habana Moscow contains 4 large independent sound proofed non-smoking rooms: "Havana meets Moscow Room", "Old Plaza Room", "Red Plaza Room" and the "Tradition Room". Each one has a maximum capacity of two people complete with private indoor bathrooms. The “Havana meets Moscow room” is the only one with a private balcony, making it the most illuminated room of the house and the only one with two single beds that can turn into one double bed. 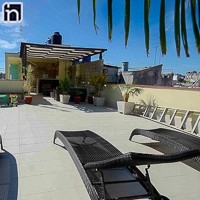 Hostel Habana Moscow also has a few common spaces where the guests can gather: a wide living room with a balcony, an indoor patio that connects the living room with the kitchen, and the most beautiful spot of the entire house, the rooftop terrace. 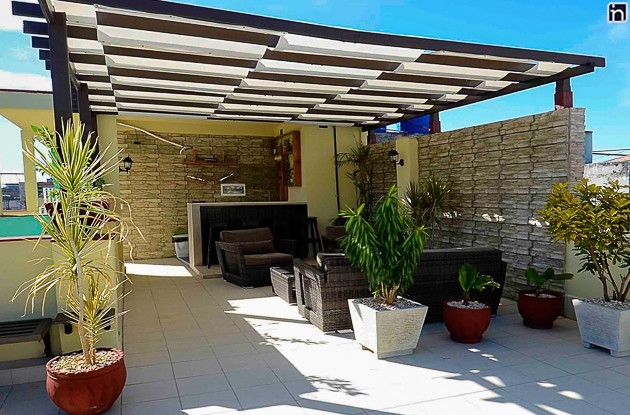 The terrace has a unique setting, equipped with a bar, sofas under a wooden pergola and a set of loungers. Perfect scenario to start the day with a nice breakfast, to have an evening drink or just to take a relaxing nap under the Cuban sun. Jorge, the owner, lived in Moscow for almost 13 years and always had the dream of having his own hotel and his main goal is to offer an almost hotel-like service to all visitors. Grand Manzana de Gomez (Cuba’s first indoor shopping mall, now converted in a trendy hotel with classy shops on the ground floor), the Floridita (one of Hemingway's favourite hangouts in Cuba), the Revolution Museum, the Plaza Vieja (Old Plaza), the Cathedral and more. Jorge Wilson invites you to into his home and delight on the amazing comfort and luxury that Havana Moscow has to offer. “Havana meets Moscow Room” is the first room and the best room of the hostel, with a spacious white balcony and two single bed that can be paired-up into one double luxury bed. A wildly illuminated room decorated in pastel pale green colour walls and white curtains gives a specific ambiance of paradise and tranquillity from the heights. The room has a narrow bathroom decorated in white and orange tiles and a whimsical blue rug, which matches the blue hairdryer. Two pictures of Havana and Moscow in each column great you as you enter the space, a spiritual tradition that connects the host’s two homes. “Havana meets Moscow”, traditional Cuban architecture and modern stiles of the Moscow. Jorge Wilson lived 13 years in Moscow, so he gets home sick when he gets back to Cuba from time to time. This bedroom is a tribute to one of his favourite’s spots in Moscow, the Red Plaza. Named after the photograph of the Red Square which hangs above the double bed, the walls are painted in beige, just as the sheets and the furniture have a wooden and rustic touch from the night table to the dresser. Even though it is smaller in comparison with the other two, it has a double sized bed and it is quieter because it has no windows or balcony. “Tradition” is the last room of the house, at the end of the hallway that connects the living room with the kitchen. 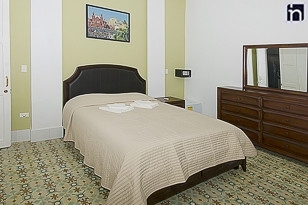 This is the most modest and smallest room of the four presented in the Havana Moscow Hostel, with black mahogany furniture. Therefore, it also has the smallest bathroom. The good thing about this room is that it is further away the others, which makes it perfect if you are looking for some privacy and closer to the kitchen, if you get hungry and want to ask for some snacks. Simple, small, cheap and comfortable is what you get with this room.